Markum Review 2019: Is Markum a Good Hosting? 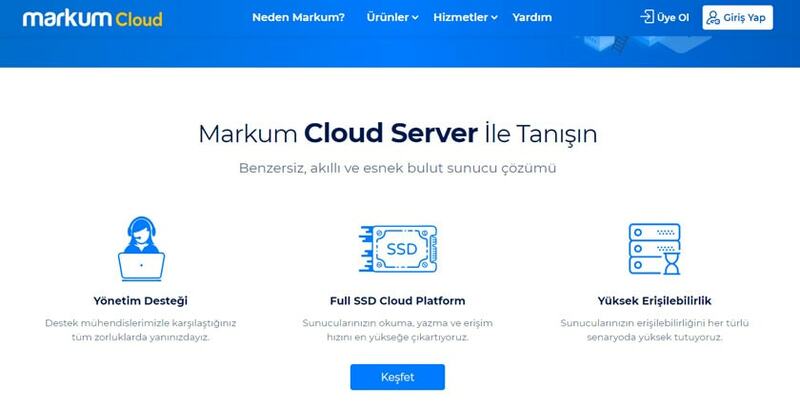 Markum is a well-developed Turkish hosting provider that focuses mainly on providing top-quality cloud solutions for different users, pros and beginners alike. The company takes pride in its rock-solid infrastructure and offers excellent 24/7 live chat support. Founded in 2000, Markum is one of Turkey’s leading hosting services with a customer base of over 60,000. It provides cloud-based solutions for personal websites and businesses of all sizes. While Markum doesn’t have its own data center, it houses its servers in two powerful data centers, Radore and Equinix, both located in Turkey. Its website and services are available in Turkish, but the team can also provide English support upon request. Markum’s products range from cloud servers, cloud email, domain services, SSL, and cloud hosting for Linux and Windows. It offers several cloud hosting packages for private users and corporations with 99.98% uptime, full SSD storage infrastructure, and full redundancy. One of Markum’s strongest points is its scalable, redundant, and flexible infrastructure. This is guarded against external threats by solid software and hardware. Markum also offers a free firewall, anti-DDoS attack mitigation, and end-to-end security services between you and their servers. Markum also boasts high levels of availability, thanks to its superior bandwidth and top-quality SSD cloud infrastructure. This means that your website will run with minimal (if any) interruptions. In addition, since Markum’s hosting plans are entirely cloud-based, you can easily upgrade your system requirements and server resources. If you want to boost your Google rankings and earn your customers’ trust, Markum offers four SSL certificate packages including Wildcard SSL. Free SSL certificates are also offered with higher-tier corporate hosting plans. There are four main cloud hosting plans offered by Markum: Startup, Standard, Professional, and Unlimited. These mainly vary in disk space and a few other features. Notably, the Unlimited plan comes with unlimited websites, unlimited disk space, and unlimited bandwidth, so this plan offers the best value if you have many smaller websites you need to host. All paid plans come to a 15-day money-back guarantee and there are currently attractive discounts on long-term subscriptions. You can make payments via bank/wire transfer, credit card, or Paracard. Getting help with Makrum couldn’t be easier. First of all, there’s a knowledge base that includes tutorials as well as an FAQ section, though the knowledge base really only covers the most general topics. You can also submit a support ticket, send an email, or — if you’re in a hurry — just start a conversation with one of their live chat support staff. From my experience with the live chat team, I was very pleased as the chat representative answered all my questions in a professional and informative manner. Hats off to Markum’s support. You can also give them a call on their support phone line. Markum also offers support via Teamviewer and AnyDesk for its customers. With its strong infrastructure, wide range of features, and attentive support team, it’s no wonder Markum is a leading hosting company in the Turkish market. However, for an experienced provider, I expected Markum to have a wider range of products — but then again, it does a good job in what it offers. Wondering how Markum stacks up against other Web Hosting companies? Enter any other Web Hosting company and we will give you a side-by-side comparison.